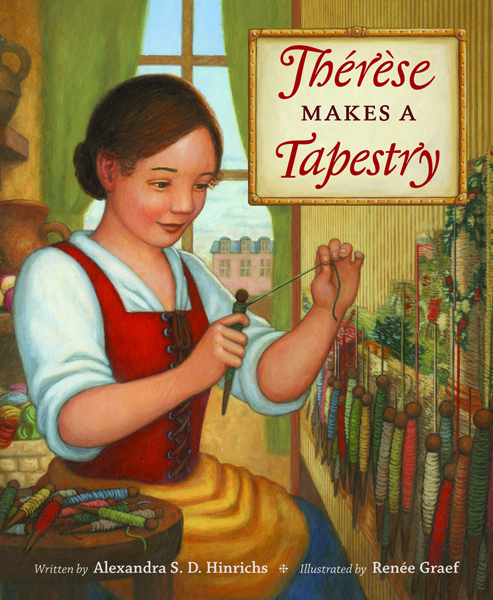 Step back in time to seventeenth-century Paris with Therese, a talented young girl who lives and works at the Gobelins Manufactory, where Europe's greatest artisans make tapestries and luxury objects for King Louis XIV. Even though girls are not trained on the great looms there, Therese practices on a small one at home and dreams of becoming a royal weaver someday.This charming story follows Therese as she carries out an ambitious plan with the help of family, friends, and the artisans of the Gobelins. The intricate craft of tapestry weaving is illuminated, and surprises await Therese, her parents and brothers, and even the king himself.Children's book author Alexandra S. D. Hinrichs here breathes vivid life into a delightful tale full of fun twists and an appealing cast of characters.Original paintings by award-winning artist Renee Graef playfully illustrate the book, as well as the many steps involved in the creation of the famous Gobelins tapestries, from dying wool and making silver thread, to painting and copying the elaborate designs, to the delicate art of weaving.Therese's fictional adventures are inspired by real people, the actual Gobelins Manufactory, and a beautiful tapestry that hangs today in the J. Paul Getty Museum. Alexandra S. D. Hinrichs loves exploring new places, including France, where she once studied. She lives in Bangor, Maine. Ren e Graef has illustrated over seventy books for children, including the Kirsten series in the American Girl collection and many of the My First Little House books by Laura Ingalls Wilder. She splits her time between Los Angeles and Milwaukee.